Well, Talk Like a Pirate Day 2016 is over and we are getting back to some semblance of normalcy, i.e. 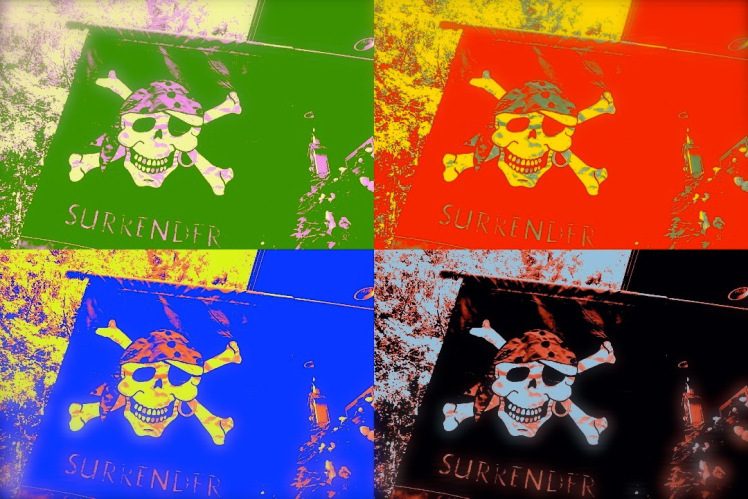 using a commonly understood dialect and not AAARRRRRGGGGHHHHHTICULATING in the little-used (no mystery why), limited pirate vocabulary that comes out every September 19th around this house. I kept at it and did manage to get something published after over 2 frustrating hours and numerous attempts. So much for giving myself a break! 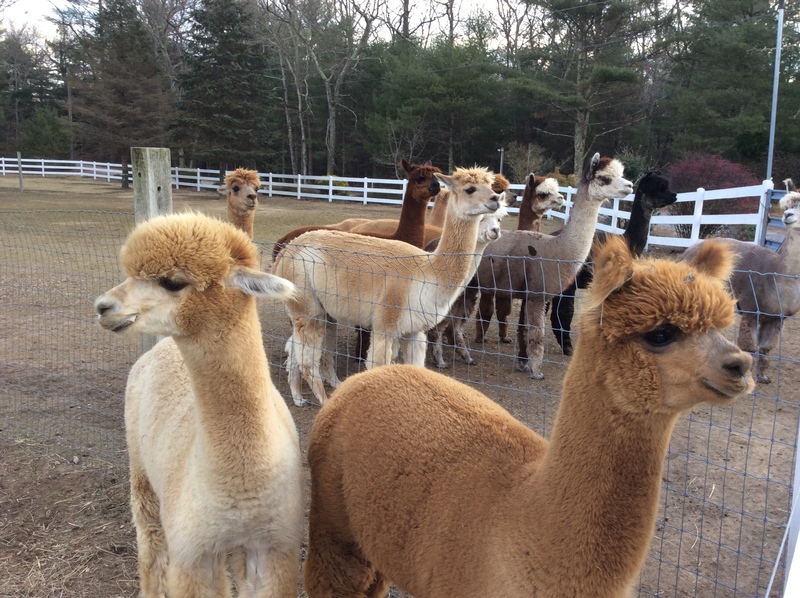 Last September, I wrote about National Farm Alpaca Day. 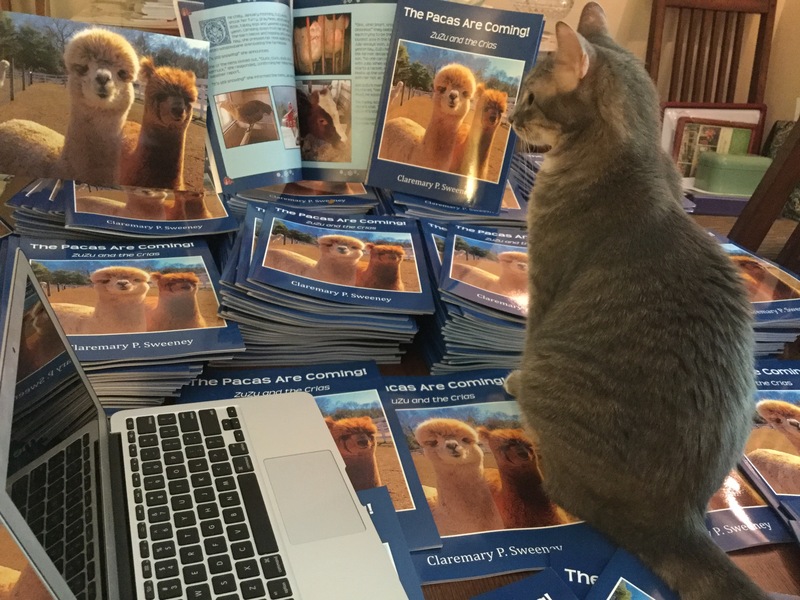 I really love alpacas and my latest book, The Pacas Are Coming! ZuZu and the Crias is all about them with lots of photos (much to Roxie’s chagrin). I’m going to try to repost this again with this new intro and another featured image. Don’t hate me! “Packas, ZuZu? And what are packas, little one?” her mother asked. “For you, little one, I’m afraid it will be an eternity,” her mother sighed. This weekend, I’ll be heading to Shadow Pines Alpaca Farm in Exeter, Rhode Island, about ten minutes from our home in South Kingstown. Bob and Vivian Ball are having an Open House September 24-25 from 11AM-3PM to celebrate National Alpaca Farm Days. The last time I was at Shadow Pines was in late May on shearing day. Alpacas, along with vicunas, guanacos and llamas, are part of the camelid family found in South America. 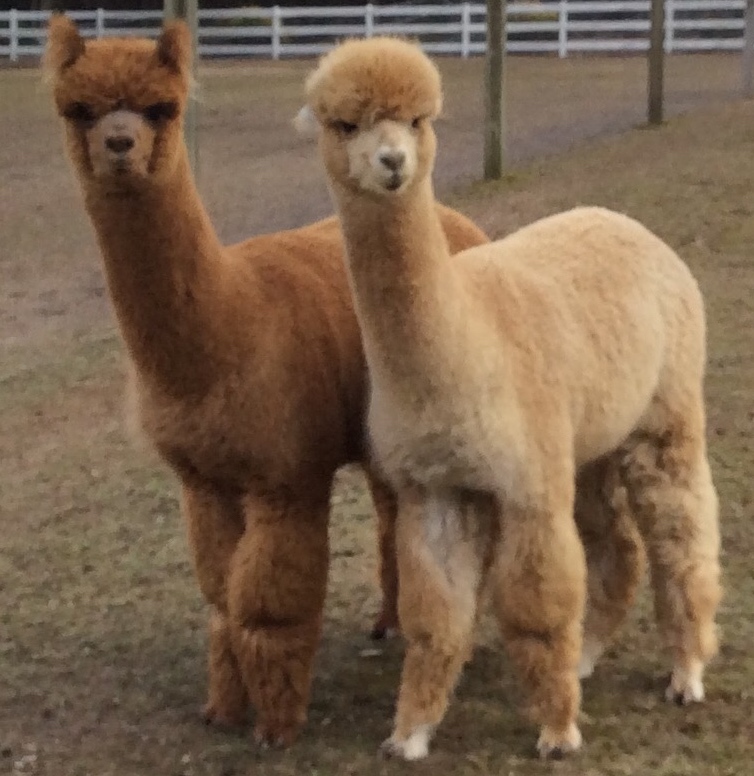 There are two breed-types of alpacas: huacaya and suri. The suri alpacas have long, silky, lustrous fleece. The photo above is of Charlie and Buzz. They are huacaya and their fleece is fluffy and crimpy. Charlie and Buzz are the alpacas from A Berkshire Tale. In the book their names are Ginger and Twyla and their mother is Dora. The mothers are called dams, the babies are called crias. Alpaca fleece is highly valued and the process used to shear these animals is quite interesting to see. This is Buzz. He’s afraid. When alpacas are angry or stressed, they hum and spit, so a cover sometimes has to be placed over their muzzles during shearing. The alpacas are much more comfortable during the warm months of summer without all that fleece and it grows back in time for our cold winters here in Rhode Island. Put a sock on it, Buzz! If you’ve never visited an alpaca farm, check out this site for more information and to find a farm near you. I love visiting Shadow Pines Farm. Bob and Vivian are welcoming and the animals are friendly and photogenic. It’s a great place for an adult/child like me to spend a day letting my imagination spin more adventures for ZuZu and her friends. awwe zuzu that is so sweet! Beautiful animals and such interesting information about them. After reading an article about alpacas, I became enthralled. I knew they had to have a chapter in A Berkshire Tale because I wanted to share them with children and adults who didn’t know much about them. Dora, Ginger and Twyla are introduced in the January chapter and continue to play a part throughout the whole ZuZu series. Glad you told us what and why they covered their faces. Poor ZuZu. She sometimes misunderstands what’s going on around her. But she is quite funny and her mama is very understanding. They all look so understanding, like they know what we’re feeling. And when they dance at sunset, they’re quite lovely. Thanks for sharing your trip to the ‘pacas Clare. I do love these gentle creatures, despite their ‘fleas’. Wonderful photos too. Thank you. ZuZu gets mixed up, sometimes, but she’s really cute. Thank you. I have tons of photos of them. I needed to illustrate A Berkshire Tale, so I apped the photos to make them look like paintingsin the book. I now have an illustrator who will do drawings for the succeeding stories in the ZuZu Series. But I’ll continue to take photos so that she’ll know what I am looking for. I somehow think alpacas and cats would be good buddies. I like your idea of reworking the photos to look like paintings. They’re good subjects to draw with those beautiful eyes and eyelashes too. They are great subjects and fun to be around. Looking forward to this weekend spending time with Buzz and Charlie. They are such beautiful animals and as a knitter, I appreciate them greatly! They yarn is lovely and because there’s no lanolin in the fleece, it doesn’t itch like wool.There are so many things to like about alpacas. I also love Alpacas for the amazing yarn they produce. A knitting friend of mine has visited a local alpaca farm several times and come home with baskets and baskets of….manure. She swears by it for her vegetable garden. Maybe your friends will let you bring home a little gift from the alpacas? Now off to find some animals to visit in my neck of the woods! Yes, the compost is great. ZuZu has difficulty with time and winter is interminable for her. They are gorgeous. I have a friend who has llamas and they also hum. At night when they are all in for the night they hum to each other. And when a baby is born they all stand around it singing a welcome. They also have a lovely system (not sure if it happens with alpacas) where one of the females in the herd becomes nanny to the baby which allows the mum some time to herself. Good system! My friend Helen has llamas and she helped me with facts for the alpaca chapter until I found Shadow Pines Farm. These animals are really endearing. Their herd instinct is something that humans could learn from, especially taking care of each other’s children. Have a great weekend, Mary. During my knitting phase, my hubby joked that he was waiting for me to turn our backyard into a home for alpacas and sheep so I could dye and spin my own yarn! Imagine those poor animals living in suburban Southern Ca. lol! I enjoyed your post so much. Thank you! Cute and oh so very wise. The shearer leaves fleece around the head and face and it gives them a teddy bear look. I really do love those alpacas, especially the ginger colored one named Charlie. He loves to give me kisses, but they’re not as sweet as my own Charley’s. Thanks for the note. Loved the feather photos. Claremary, I’ve nominated you for a Sunshine Award! Zuzu this is a wonderful piece … I loved the extract from your book and I adored the pictures. The Bean (who you would not like – she is my dog) has met Packas here in France. She is most suspicious. Now that I am better informed I will be able to reassure her. Cute! It makes me smile as wide as possible, as it is said “till my ears”! I do love this story. I need Grandies to snuggle up and read it to! If your daughters will humor you a bit and cooperate, then I’ll keep writing these ZuZu stories. Next year’s will be a Christmas one set in Stockbridge during the Annual Norman Rockwell Weekend. I think you’d like the celebration. It’s the first weekend in December. The other part of the blog with the information on was interesting as well. I love Llamas/Alpacas and it was interesting to read about them. I pity the poor naked one. I hope it isn’t too cold at night for him/her. Cold winters and hot summers. I say… is that really fair? Finally…. shame on you for the link with the jokes. Alpaca Socks? Really???? Jackie, You should have been there in May when the shearing was going on! I have video. Their fleece has grown back now and I’ll take some photos on Sunday when I go to visit the farm. This story is an excerpt from one of the 10 ZuZu tales in A Berkshire Tale. They’re all charming bedtime stories which follow the first year in the life of a little kitten. I just made the January chapter into its own little book- The Pacas Are Coming! ZuZu and the Crias -because the kids love it so much when I go to schools to read. I used the same text, but lots more, bigger photos. I’m going up to the Berkshires in November and December to take some photos for next year’s ZuZu Christmas Book. I need there to be snow. Jackanory? Named in honor of you? I’m enthralled. Socks: who knew they were so versatile! I have a funny feeling there would be a tussle in your house to see who could get the sock over the other’s head first! They are very cute animals. I’m also highly impressed that professional alpaca shearers use a muzzle cunningly disguised as a sock so the creatures don’t suspect what is about to happen. Ben, They have them for people to0 – in argyle, actually. Barber shops here in RI use them on loud, screaming children. Or 0n their nose(s). Now who’s sorry? I was just visiting the alpaca farm near my home yesterday. They were very frisky – I guess because it’s Fall and a bit cooler in RI. I bought some alpaca socks. Quite lovely, I must say.